Victoria has a moderate climate. This means that it doesn’t get extremely hot or extremely cold. (This is one of the reasons that many people like to retire to Victoria!). We don’t normally get snow like other parts of Canada. However, it can happen, usually in February. Most Canadians are familiar with snow because they live with it for several months of the year. In Victoria, we do not! 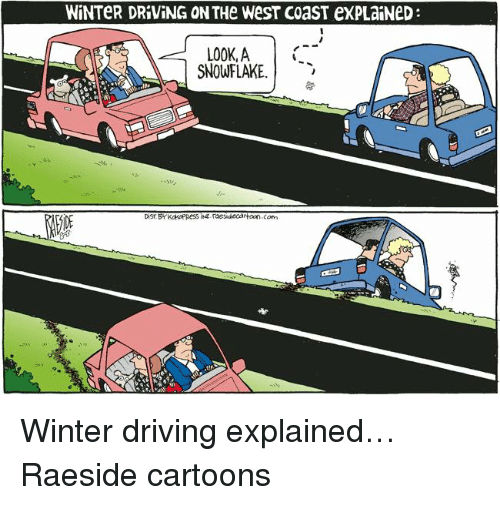 Many Victorians don’t know how to drive in the snow, so we get very nervous in snowy or icy weather. Some people take the bus instead, and many just stay home if they can. School often gets cancelled because it is dangerous for parents to drive on snowy roads to pick up their children. If you live on top of a hill, you will probably be stuck there until the weather gets warmer because the hill will be too icy to drive up (or down). Even a few centimeters of snow can throw the city into chaos! In 1996, a big blizzard hit Victoria and Vancouver. It was a huge surprise for the city, and anybody who lived on the West Coast at that time will definitely still remember it. (Theresa and Melissa do!). We call it “The Blizzard of ’96.” Or, you can simply call it “The Blizzard.” Victorians love to tell stories of that crazy, adventurous time. Theresa’s backyard during The Blizzard! So, take another look at the meme and the cartoon… You will probably laugh!